First let's talk about the cost of the event. Disney After Hours tickets can be purchased in advance for $119 plus tax per adult or child. If you wait until the day of the event, the cost goes up to $124 plus tax. DISCOUNTS: You are eligible for a discounted $89 plus tax ticket if you are an Annual Passholder or Disney Vacation Club member. This ticket is your park admission. If you purchase a ticket to Disney After Hours you will get access to Magic Kingdom Park beginning at 7pm. Unlike a dessert party, park admission is not required in addition to the ticket. The number of ticket available is extremely limited, which leaves guests with a virtually empty park! 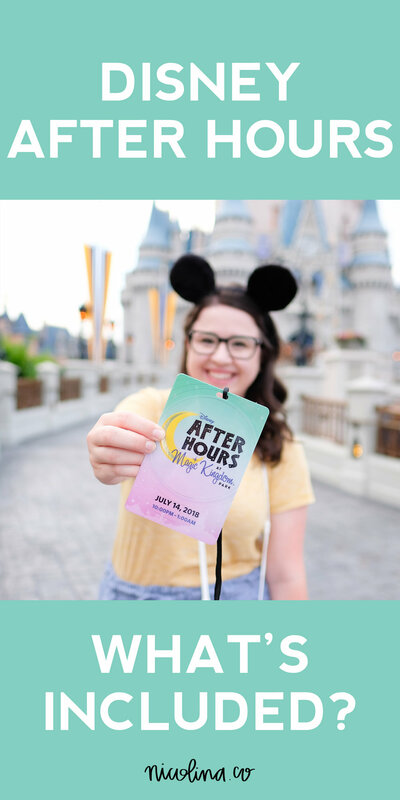 Disney After Hours - What's included in your ticket? Our experience took place Saturday, July 14th. The night began by checking into the event which was a super easy process. 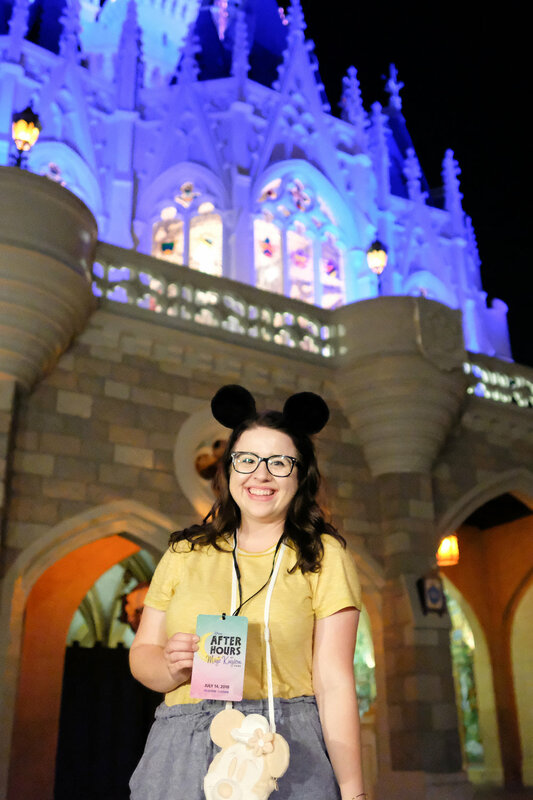 There are lots of Cast Members and signs with the adorable After Hours logo on them pointing the way. Once we got our lanyards we were free to play in the park! We got checked in and situated in the park right around 7pm. This was perfect for getting some in front of the castle photos, and heading to grab some dinner after the main dinner rush and while guests were securing their Fireworks viewing location. 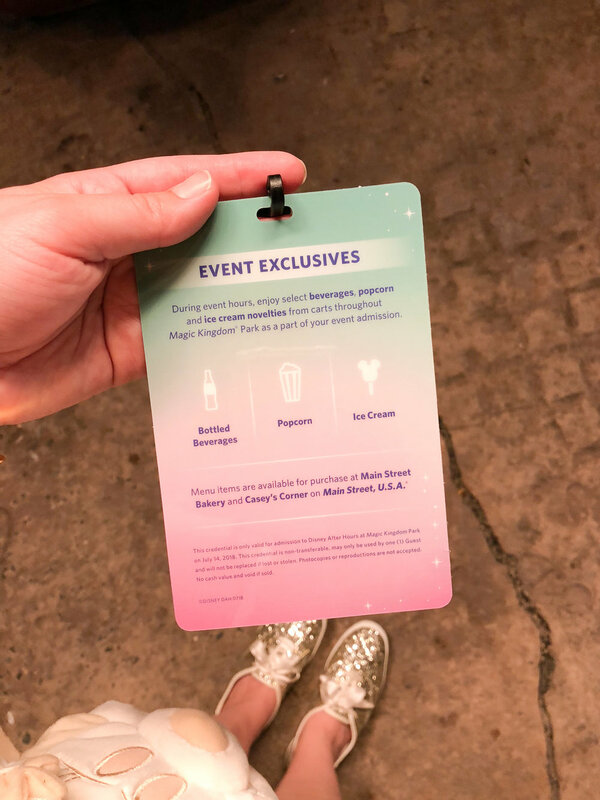 While all you can eat Mickey Bars and Popcorn are amazing, the only food locations that are open during the event were going to be Casey's and Main Street Bakery. Neither one of those locations have good allergy friendly options so we wanted to make sure that we ate dinner before the main food locations started closing for the night! After dinner we relaxed and wandered a little bit. I thought it might be fun to watch the fireworks while riding Dumbo so right about 9pm we headed to Storybook Circus. There was no wait for Dumbo, everyone was busy watching Happily Ever After. It was a really fun view of the fireworks, obviously you can't see the castle projections from there. It's hard to tell when you are standing on Main Street but from Storybook Circus you can see that most of the large fireworks are set off from behind the Storybook Circus area. It was a great, not crowded way to enjoy them! We still had some time before the event officially kicked off so we grabbed some coffee and headed back to Fantasyland. I thought it would be a good idea to hop right on a ride that already had little to no wait while the rest of the park emptied out. Right at 10pm, as the event started we walked right on Winnie the Pooh. Then Peter Pan. Then It's a Small World. Within 30 min (and that included stopping to chat with some friends) we had done basically all of Fantasyland. I had been checking the wait times throughout the day and the shortest I saw Peter Pan was 50 min. Each ride in Fantasyland was under a 5 minute wait. It's a Small World was a walk on, the boat in front of us was totally empty! After we had a few rides under our belts we were off to find some Mickey Bars and Popcorn. We also grabbed a Coke and a bottle of water while we were at it. I wanted to add that we did this event back in 2016 and literally I told our friends that the only thing the event was missing was popcorn. So unlimited popcorn was quite the ask and you shall recieve moment! The ice cream and popcorn carts were pretty well sprinkled throughout the park. We didn't really have to wait more than 5 minutes for snacks or drinks any time we went to grab them. After we were full on Mickey Bars and popcorn we headed to Adventureland and rode Jungle Cruise and Pirates of the Caribbean. Again, we walked right on both of those rides with no wait at all! Next up was Frontierland and while we decided to skip Splash Mountain we couldn't resist riding my favorite Big Thunder Mountain Rail Road. Then it was time for more snacks! This time I got popcorn and Cam got the Mickey Bar. This is where your night may differ from ours a little bit. Cam and I really wanted to enjoy the total emptiness of the park. So we took a little break from rides to walk around and see things that we love not being totally over run by people. I mean when do you see this area totally clear of guests! We ran into some friends Chelsea (@styledbymagic) and Katie (@fairytalefoodie)! So after taking some time for wandering and appreciating an empty Magic Kingdom we headed to grab one last ride. We chose Seven Dwarf's Mine Train. I think everyone had the same thought because it was the longest line of the night. Mind you, it was only about 10 minutes which is crazy! After we got off the ride, we decided to head out! It was almost 1am, and we were getting pretty tired. Here is where my one complaint about this event comes in. The monorails were not running. The options were bus to your resort or ferry back to the Transportation and Ticket Center. While this doesn't seem like a huge deal, I probably would have been upset if I was staying at the Grand Floridian and had to take a bus when I was expecting to be able to hop on the monorail. Overall it wasn't a big deal for us, we took the Ferry back to the TTC and trammed to our car. If you are an Annual Passholder or DVC member. That discounted ticket price is kind of a no brainier! I know personally we are always looking for new things to try in the parks. I am telling you an empty Magic Kingdom is just the dream. If you are a night owl. This event is not cheap, but in my opinion there are ways to make it work for you. If you are visiting and want to make this part of your vacation I wouldn't make this a long park day. Spend the day enjoying the resort while the sun is out. Don't waste a park ticket day on this. When you purchase the After Hours ticket, you can enter the park at 7pm. The sun isn't as oppressive as the afternoon and now you are well rested and ready for your night of fun! Have a game plan. Choose a starting point, I would suggest a ride that is already a pretty low wait, right as the event begins. This gives the rides like Space Mountain time to clear out before you jump on! The family in front of us on our last ride rode Big Thunder Mountain 6 times! Make the most of your time in the park and make sure you hit all of your favorites at least once! You can purchase tickets thorough your Travel Agent or via Disney directly here. I want to thank Disney again for providing us with tickets to this event. We had an amazing time! Want to save this post to read later? Pin one of the images below!